In the beginning of the 2011 CSA season, I set a goal of exploring my Polish roots through cooking. Kapusta (cabbage) is a Polish staple food, and I know that my ancestors cooked kapusta and onions with caraway seeds. 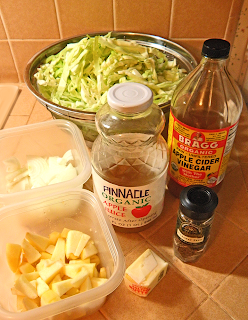 The triple apple addition in this recipe (apples, cider, and vinegar) compliments the cabbage by adding sweetness, texture, and a bit of tartness. Live Earth Farm’s semi-retired recipe maven Debbie found the original version of this recipe in an “undated Bon Apetit clipping.” I added the apple and caraway seeds (cider and vinegar are from original recipe). Note that 2 lbs. of cabbage is a fairly large head. Because you will cut the core out, cabbage can weigh more than 2 lbs. As noted in an earlier post, apple juice may be substituted for apple cider in any recipe that is cooked. In the US, apple cider is raw, unprocessed liquid from pressed apples, and apple juice has been heated to eliminate bacteria and fungi that grow on apples. This mellow and flavorful dish is equally at home with potatoes and roast pork for dinner or with various no-meat dishes at a vegetarian potluck. Cut onion in half and slice thinly. Core and thinly slice cabbage. Core and peel the apple and cut into ½ inch chunks. Melt butter in large pot over medium-high heat. Saute onion it begins to soften, about 5 minutes. Stir in apples to coat with butter. Add cabbage. 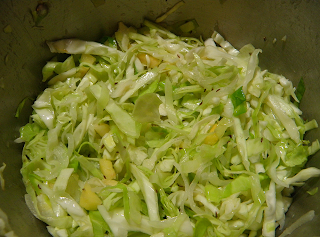 Saute until cabbage is slightly wilted, stirring up from the bottom frequently, about 5 minutes. Stir in apple cider and caraway seeds. Reduce heat to medium. Cover pan and cook until cabbage is tender but still crunchy, stirring occasionally, about 6 minutes. Uncover pan. 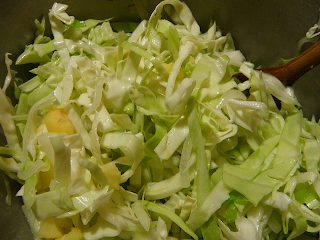 Raise heat to medium-high and simmer until almost all the liquid evaporates, about 5 minutes, stirring cabbage up from the bottom constantly to avoid burning. Stir in vinegar. Season with salt and pepper to taste.